It’s that time of year again on the high school track and field schedule. As it does every year, the BYU Invitational last weekend put many of the state’s elite athletes in a major competition at the venue that will host the state meet in two weeks. While state records fell at BYU, some schools opted instead to continue their prep for the state finals at the Herriman Twilight Invitational, which is also traditionally contested the same weekend as the BYU Invite. Four state records fell over the weekend and that is our TOSH Top Story. Additionally, nearly half of the previous top event marks for this year were bested at the two events. Xakai Harry of Davis came out of nowhere to set a new overall state mark in the long jump. On his final leap of the day Friday, the junior went far beyond, by more than a foot, his previous season best to set a new record at 23’10.50. The old state record, which was set back in 2003 by Boian Marinov from Wasatch Academy, was 23’10. 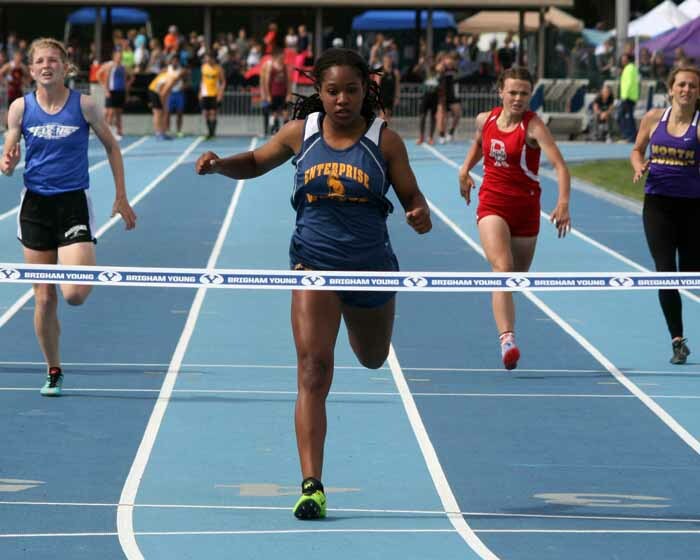 Enterprise sprinter Jaslyn Gardner shattered the 200-meter state record in her Friday qualifying heat. Her 23.75 goes into the record book in place of the previous-best 24.18 second 2008 sprint by Natalie Stewart from Spanish Fork. Gardner appeared to have lowered the standard even more in Saturday’s final, but her time was 23.69 was considered wind-aided. The third record to fall at the BYU Invite goes to American Fork distance runner Casey Clinger, who broke his own state mark in the 1,600 set at last year’s state meet. The senior won Saturday’s race in 4:06.22, toppling his previous record of 4:07.52. At the Herriman meet, the 4×400-meter relay team from Syracuse took another chunk out of the state record it set less than a month ago. The Titan relay ran a 3:16.19, better than its own 3:16.66 from April 15.